This may not be much, but it is a start. This cathedral was designed by the great A.W. Pugin himself. CAP. Secular songs to be banned at cathedral ceremonies. Songs that are not religious in nature will no longer be allowed at ceremonies in St. Aidan’s Cathedral in Enniscorthy. The cathedral’s authorities, who are concerned at an increase in the use of such songs, in particular during wedding and funeral liturgies, have told parishioners that pop music and folk songs will no longer permitted. The authorities feel that although pop or folk songs involved may well be beautiful, they do not respect the sacred character of the liturgy. Curate Fr. Richard Lawless said he and his colleagues were very mindful in particular that newly-bereaved people were going through a difficult time and would be ‘diplomatic and not dogmatic’ in dealing with requests for the use of various songs. He said the priest involved would explain why a church was, or was not, an appropriate setting for certain music. “The primary role of a priest is pastoral care, but in the event of a family pointing out the importance of a certain piece of music, that they say must be used for a ceremony, we will look at facilitating and accommodating the request,” he told the congregation. “We are really asking people to respect the sacredness of the building and also the occasion,” he added. Fr Lawless said certain songs could be used, if so wished, in a funeral home or in a cemetery when the prayers and the Christian part of a funeral service are over. It was the wish of the parish not to upset or offend parishioners in the matter, he went on. San Bernardino Diocese, CA, USA. The present officers of Una Voce San Bernardino (UVSB) came together to take on this apostolate for the promotion of the Latin Mass in January of 2009. One of the first things we did was to write our Bishop to introduce ourselves to him and what we were planning to do with this apostolate; after three (3) letters, we have received no response. Much discussion and action has taken place since then, from meetings and contact with numerous priests within the diocese as well as outside the diocese to discuss practical issues concerning the implementation of Pope Benedict XVI’s motu proprio, Summorum Pontificum (SP), to the development of a locally popular website (www.unavocesb.org), as well as other resources made available through the website such as studies and booklets. Shortly before SP, there was only one parish offering the Traditional Latin Mass (TLM) in the diocese, and that was at San Secondo D’Asti in Guasti, CA. It continues to average about 350-375 persons assisting at the TLM. Shortly after SP, the TLM began in Palm Desert at Sacred Heart Parish. But, we were told that after a few months, the numbers dropped from close to 200 down to 30-50; later I think we found out why. In February of 2009, 3 officers of UVSB assisted at what we had expected to be the “TLM” in Palm Desert, but to our amazement, we found not the TLM, but a sort of hybrid Mass, which I could only describe as a “Novum Tridentum” Mass. Needless to say, it followed neither rubrics of the TLM or the Novus Ordo Mass. The abuses were too many to enumerate here. UVSB drafted a letter addressed to the pastor about our concerns and our willingness to help rectify the issues, but we received no response. 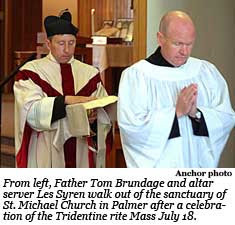 About a year after SP, the TLM began in Adelanto. Here too the numbers are reportedly dropping. But, I do not think it is due to the way it is celebrated. In fact, I have heard good things about the priest who celebrates this Mass. It must be something else then. It is at a parish that is hard to find and “out of the way” so I have been told. They were also told by higher authorities that they had to have at least 50 persons assisting, not including children, to continue in the future. Though this is not a requirement of SP, obviously, I have received confirmation that it is standard diocesan policy that a pastor has the right to abolish any Sunday Mass celebration which has less than 50 persons assisting. We have also been advised by a person doing this apostolate for many years, that any parish who wants the TLM needs to form a “Latin Mass Committee” at the parish level, to do all the leg work to help the pastor implement the TLM. He advised no more than 4-5 persons. One person is the MC, the other handles the music, then one for altar server training, the other is concerned with contacting priests, and perhaps one for ushering. We have done just that, and contacted persons interested in having the TLM at their parish to form these groups for at least 2 additional parishes, which are about 20 miles apart from each other, and from the other established parishes already in existence. We have compiled a list of priests willing to substitute for any of these regularly scheduled TLM’s, but could not themselves offer it regularly. I was told by one of them, the responsibility for celebrating this Mass for the people who request it, is primarily the pastor. If he cannot learn it, he must provide a priest who can. This past week, on August 26, Richard Friend and Mike Parish from Temecula organized the celebration of a Missa Cantata at St. James the Less Parish in Perris, CA, inviting Father Carl Gismondi, FSSP from San Diego to celebrate this Missa Cantata. I was contacted by Richard three months prior to this Mass. Many hurdles needed to be jumped over before we were able to make it happen. We scrambled for liturgical items, and even on the evening of, a few hang ups took place, but by the grace of God, the most important thing was a success, the Holy Sacrifice of the Mass was offered in the Extraordinary Form of the Roman Rite, with every bit as much dignity and reverence that is “right and just” due to God. There were close to 200 people asissting at this Mass; we even ran out of consecrated hosts. Also, there is talk of the formation of a young adult group which would have chapters in the Los Angeles, Orange County, and San Bernardino Dioceses. By the grace of God, this work continues, here and elsewhere. Apologies for the delays in posting other news, especially those entailing translations, commentary, and extensive editing. I am tired and under the weather right now. CAP. "In fact, Bishop Alfonso de Galarreta is the president of the commission charged of the preparation of the dossiers that will be studied during the theological talks with the representatives of the Holy See. This commission, [which is] internal to the Fraternity of Saint Pius X, established last April, is not a bilateral commission." Italian religious journalist Andrea Tornielli defends himself today from those inside the Vatican who have tried in the past few days to discredit his explosive report on the ongoing bureaucratic steps of the reform of the new Mass of Paul VI. We first mentioned Tornielli's report last week. Tornielli has been the great Vaticanist of the Ratzinger pontificate; his record is not flawless, as he himself admits, but he is far more trustworthy than most - even those inside the Vatican. "I worked under Cardinal Bernardin and he taught me how to collaborate..."
This morning’s mail brought a package from a good friend in Stockholm: The newly published Missale Parvum. 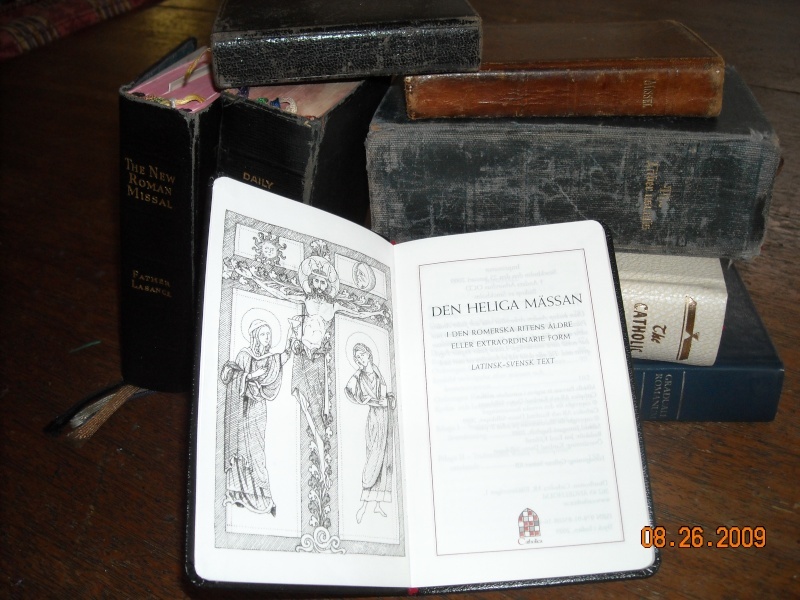 Although not as extravagant as some of the new Missals seen in recent years, the appearance of this Latinsk-Svensk Missal is in many ways far more significant as it is the first Swedish language edition of the 1962 Missal to be published in more than forty years and is arguably the first to bear the imprimatur of a Swedish bishop in centuries. Publication of the new Missal was prompted by the growing number of traditional Catholics in the country who were highly instrumental in bringing it about. The Church in Sweden has suffered greatly since the 16th century when King Gustav I broke with Rome and established the protestant Church of Sweden, rendering it more or less illegal to be Catholic. Over the years, practice was tolerated among foreigners and there were numerous “closet Catholics” who managed to quietly kindle the Faith as best they could under the threat of expulsion from the country for being identified as Catholic. An Apostolic vicariate was erected in 1783 to serve Catholic immigrants. It was subordinate to the Archdiocese of Paderborn in what is now Germany. As of 1873, native Swedes who had reached their eighteenth year were free to leave the state Church and join other religious societies; however proselytizing was strictly forbidden and such converts found many other official obstacles strategically strewn in their path. The vicariate was only elevated to the status of diocese in 1953 and it wasn’t until the year 2000 that the state Church of Sweden was disestablished and it finally became possible for the Catholic Church to register and be officially recognized by the government. Today, the Diocese of Stockholm encompasses the entire country and consists of 42 parishes. It has been served by five bishops in succession and is presently shepherded by His Excellency Anders Arborelius, OCD. Bishop Arborelius is a convert to the Faith and is the first ethnic Swedish bishop since the kingdom fell to the protestant conquest. Today Catholics comprise only about 2% of the total Swedish population but they are one of the fastest growing areas of the Church in Europe, attracting increasingly large amounts of converts from the domestic population annually - and it should be noted that traditional Catholicism has been playing an important role. The Swedish Friends of the Institute of Christ the King Sovereign Priest is a lay association which has worked tirelessly for years to propagate the traditional Mass in the country and is largely responsible for bringing the Missal Parvum into reality. Bishop Arborelius, whose imprimatur appears on the new Missal, has proven to be a true friend to tradition and has cooperated with the ICRSP to bring the traditional Mass to four different parishes in the diocese – including the Cathedral! Some Masses are offered by diocesan priests, others by priests of the ICRSP. In addition to these there is a Sunday Mass offered at Gothenburg by the parish priest and another offered by the Friars of the Franciscan Conventual Chapel at Jonsered. 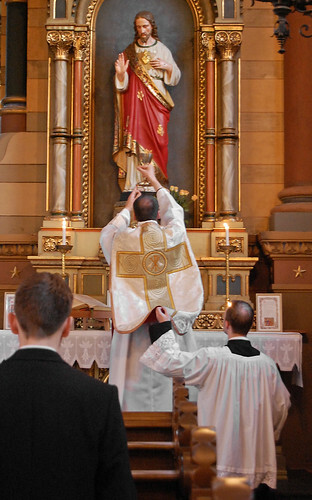 The SSPX also offers a Mass in Stockholm. The majority of the roughly 200,000 Catholics in present-day Sweden belong to non-Swedish ethnic groups with Poles being the largest of these, followed by Croats and Hispanics. Interestingly it is ethnic Swedes, most of whom are converts from Swedish Protestantism, who form the bulk of the traditional Catholic community. How things will develop from here will be worth keeping an eye on. The Church which had once almost completely disappeared from Sweden is now returning to, what is in some ways, a clean slate. Swedes in general did not suffer from the post-conciliar tumult that ravaged the Catholic world in the late 20th century largely because the Church was only marginally present among, or accessible to the Swedish people during most of that period. Today’s emerging convert population has a choice between two rites of equal footing. What we will be witnessing in the coming years is something never before seen: A test case that will show which liturgical path a historically Catholic European population will choose when given clear options as it re-embraces the Faith. In the unique situation of the Swedes, it is a choice between the rite which was pried from the hands of their Catholic ancestors by protestant rebels, and the rite devised 40 years ago by the post-conciliar Church in exile. Let us remember to pray for the sons and daughters of St. Bridgit as they usher Christ’s Church back into their kingdom – they may very well be constructing the model for the western Church in the 21st century. Our Una Voce chapter is launching ... an ad campaign, thumbnails attached. 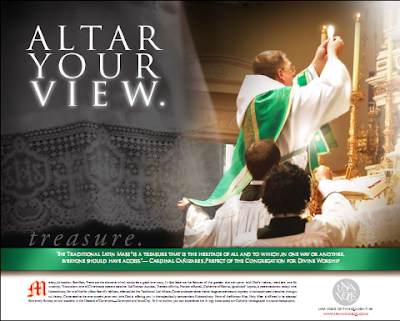 These ads are designed to expose as many as possible to the beauty of the TLM, to inform them about its status in the Church, and to invite them to attend the TLM nearest them. We plan on releasing versions of these ads in local papers, on internet sites, in 16x20 posters, etc. and also making versions (with modified information) available for a nominal fee to other groups promoting the TLM. Videos of a few highlights of some liturgical services celebrated earlier this year in the (Russian) Catholic parish of the Byzantine Rite in Lyons, St. Irenee, are now available on the "vincentraveau" channel on Youtube. The chanting of litanies during the same Divine Liturgy. St. Irenee is one of only two remaining parishes of the Russian Greek Catholic Church (Byzantine Rite) in France, and one of only about twenty Russian Greek Catholic parishes, chapels and monasteries throughout the world. In these small places of prayer -- magnificent remnants of the great project of reuniting Russian Orthodoxy to Rome, a project now almost forgotten -- the Russian liturgical tradition is celebrated according to the command of Pope St. Pius X, "nec plus nec minus nec aliter", a tremendous display of the richness and diversity (rightly understood and practiced) of Catholicism. More articles coming up. We request your patience. ROME The document was delivered to the hands of Benedict XVI in the morning of last April 4 by Spanish Cardinal Antonio Cañizares Llovera, Prefect of the Congregation for Divine Worship. It is the result of a reserved vote, which took place on March 12, in the course of a "plenary" session of the dicastery responsible for the liturgy, and it represents the first concrete step towards that "reform of the reform" often desired by Pope Ratzinger. The Cardinals and Bishops members of the Congregation voted almost unanimously in favor of a greater sacrality of the rite, of the recovery of the sense of eucharistic worship, of the recovery of the Latin language in the celebration, and of the remaking of the introductory parts of the Missal in order to put a stop to abuses, wild experimentations, and inappropriate creativity. They have also declared themselves favorable to reaffirm that the usual way of receiving Communion according to the norms is not on the hand, but in the mouth. There is, it is true, and indult which, on request of the [local] episcopates, allows for the distribution of the host [sic] also on the palm of the hand, but this must remain an extraordinary fact. The "Liturgy Minister" of Pope Ratzinger, Cañizares, is also having studies made on the possibility to recover the orientation towards the Orient of the celebrant, at least at the moment of the eucharistic consecration, as it happened in practice before the reform, when both the faithful and the priest faced towards the Cross and the priest therefore turned his back to the assembly. Those who know Cardinal Cañizares, nicknamed "the small Ratzinger" before his removal to Rome, know that he is disposed to move forward decisively with the project, beginning in fact from what was established by the Second Vatican Council in the liturgical constitution Sacrosanctum Concilium, which was, in reality, exceeded by the post-Conciliar reform which came into forceat the end of the Sixties. The porporato, interviewed by monthly 30Days in recent months, had declared regarding this: "At times change was for the mere sake of changing from a past perceived as negative and outdated. Sometimes the reform was regarded as a break and not as an organic development of Tradition." For this reason, the "propositiones" voted by the Cardinals and Bishops at the March plenary foresee a return to the sense of sacredness and to adoration, but also a recovery of the celebrations in Latin in the dioceses, at least in the main solemnities, as well as the publication of bilingual Missals - a request made at his time by Paul VI - with the Latin text first. 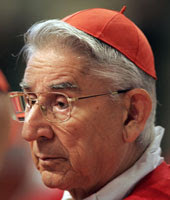 The proposals of the Congregation, which Cañizares delivered to the Pope, obtaining his approval, are perfectly in line with the idea often expressed by Joseph Ratzinger when he was still a Cardinal, as it is made clear his unpublished words on the liturgy, revealed in advanced by Il Giornale yesterday, and which will be published in the book Davanti al Protagonista (Cantagalli [publisher]), presented beforehand at a congress in Rimini. With a significant nota bene: for the accomplishment of the "reform of the reform", many years will be necessary. The Pope is convinced that hasty steps, as well as to simply drop directives from above, serve no good, with the risk that they may later remain a dead letter. The style of Ratzinger is that of comparison and, above all, of example. As the fact that, for more than a year, whoever approaches the Pope for Communion, have had to kneel down on the kneeler especially placed by the cerimonieri. RORATE note: The Pope needed, for practical purposes, this first bureaucratic step by the Congregation for Divine Worship. His decisions on this matter will come in the next few months and years. May God grant him many more fruitful years of work as Successor of Peter. The Argentinian Catholic website Panorama Católico Internacional published this week the news that the current Rector of the Seminary of the Priestly Society of Saint Pius X (FSSPX / SSPX) in Argentina, Bishop Alfonso de Galarreta, has been named chairman of the SSPX side of the joint Vatican-SSPX commission in charge of the theological discussions. 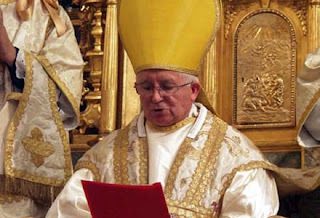 Panorama adds that sources "close to the SSPX" inform that the Bishop will remain as rector in Argentina for the moment, but may change if his duties in Europe (that is, as part of the commission) deprive him from the time that is deemed necessary for the activities of the seminary. The liturgical reform of the reform is moving apace, slowly but steady, in the Catholic Diocese of Pensacola-Tallahassee. Yours truly has just been authorized to release this academic year’s schedule of Traditional Latin Masses. They will each be celebrated at 2:00 pm at Tallahassee’s Cathedral of St Thomas More. As you can see, the Masses are celebrated on a quarterly basis (there was one additional [Low Mass] celebrated on June 28). This is far from ideal, but the faithful are building up to a weekly High Mass. But this ideal will not come to be unless there is consistent, significant attendance at these Masses (which there has been so far, thanks be to God), and if the faithful are not generous in their tithes when the collection plate comes around. Rest assured: whatever is collected at these Masses goes toward the celebration of the traditional liturgy. The Mass on October 4 will be celebrated with a brand new set of gorgeous vestments, purchased from the funds collected on June 28. So please be generous with both your time and money, and patronize these liturgies! Vote with your feet! I encourage non-Catholics to attend as well. The traditional Catholic liturgy, with all its artistic treasures, is one of the historic bedrocks of Western Civilization, and so the common patrimony of all mankind. Your presence would be most welcomed, and greatly appreciated. There will probably be refreshments served after the Mass. Hope to see you all there. Reminders will be posted as we draw nearer to these dates. ... and it is ugly and barren. More pictures later. 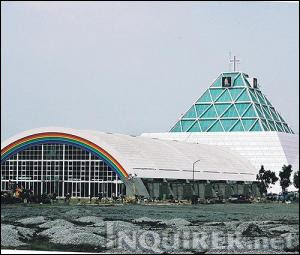 The "church" (which does have a sanctuary with an altar, and a large "baptismal healing pool" inside the structure) was set up by, and falls under the control of, El Shaddai, the largest and most powerful of the Catholic charismatic groups in this country and in all of Asia. Its unorthodox practices have led one archdiocese to ban it, but its numbers (as many as 7 million, according to some estimates) guarantees that its influence within the Philippine Church will remain practically unchallenged. According to The Latin Mass magazine (subscribe here), Italy has just witnessed the publication of a soon-to-be blockbuster on Vatican II. Monsignor Brunero Gherardini, a renowned 85-year-old theologian of the Roman school, has descriptively entitled his work Vatican Council II: An Open Discussion. The volume is published by Casa Mariana Editrice, a publishing house connected to the Franciscan Friars of the Immaculate, and it boasts a forward by Bishop Mario Oliveri (of the Albenga and Imperia diocese) and an introduction by Archbishop Malcolm Ranjith, the former secretary of the Congregation for Divine Worship, who is now the Archbishop of Colombo and Metropolitan of the Church in Sri Lanka. The web site of the Society of Scholastics, on whose Board of Advisors the author sits, says that Monsignor Brunero Gherardini resides “at the Vatican as a Canon of St. Peter’s Basilica, he is the secretary for the Pontifical Academy of Theology, professor emeritus at the Pontifical Lateran University, and the editor of Divinitas magazine.” Divinitas is a respected Roman journal of theology. Alessandro Zangrando, the Rome Correspondent for The Latin Mass, gives us a sneak preview by way of some excerpts from the book, which he says has reportedly reached the Pope’s desk, and is soon to be published in English. I would think that the arrival of such a book is an occurrence of major import. First, it is authored by a weighty and respected theologian, who is a priest in good standing with the Church — not a man that can be taken as a spokesman for a movement, a mere controversialist, or an “interested party” in the debate. Second, its forward and preface are by two seated diocesan ordinaries (one, a former Roman curial official who may well return to the Holy See one of these days). Third, it is published by a publishing house attached to a vibrant and young branch of the Franciscan Order, raised to Pontifical Right status by none other than Pope John Paul II. That Order itself boasts some accomplished theologians (such as the American, Father Peter Damien Fehlner, FI). Finally, if Mr. Zangrando’s contacts are correct, and the book is indeed on the Pope’s desk, the Roman Pontiff may choose to respond positively to the just-quoted respectful appeal made to his authority, or at least pave the way for his successor to do this. If the passages provided by The Latin Mass are any indication, Vatican Council II: An Open Discussion may also provide a wonderful catalyst for the Rome-SSPX dialogue. Dr. Francisco Romero Carrasquillo, an old friend of our blog, sends us news of very interesting new courses this year, including "The Latin of St. Thomas Aquinas" and "Ethics and Epistemology". More information available here. A bombshell of an interview. Mons. Domenico Bartolucci on the liturgical reforms and the reform of the reform. An interview with Mons. Domenico Bartolucci, Maestro Perpetuo of the Sistine Chapel under five Popes. The original Italian can be found here. The liturgical reform of the 1970-ies is today taking up much space in the theological discussions, because liturgy and theology are mixed up in a – may we venture to say so – “transcendental relation”. It is not possible to discuss the one without taking up the other, if one does not want to fall into that theology of watertight compartments that was in use in the 1950-ies. Today it is necessary – in the wake of a more vast debate in which we engage ourselves – to formulate an open and straightforward analysis of what has happened and take an appropriate attitude towards the practical remedies and above all remedies that are “realizable” (realizzabili) as Saint Pius X used to repeat. Upon the request of so many of our readers, our Editorial Office also would like to occupy itself with the argument, if possible avoiding the repetition of the methodological errors of the past. Therefore it is our wish to initiate the true transmittance of the authentic Tradition.– basing ourselves on the testimony of those who have known the past, because of their age and their prestige, and not only because of their authority. As liturgy is also practical science, we have not wished to start off with pontificating “liturgists” who say they have read so and so many books and codices, but rather take the matter up with someone who has lived and touched the liturgy as nobody else has, because he has prepared, repeated, coordinated and known the religious ceremonies in his Tuscan countryside, ceremonies which concluded with the “Messa in terza” (a mass celebrated by three i.e. Solemn Mass -- CAP) and the unfailing processions with a musical band, as well as the splendors of the “Cappella Papale” in the Sistine chapel. We have the honor of introducing to you Monsignor Domenico Bartolucci, in an interview done by us lately. He was born in 1917 in Borgo San Lorenzo (Florence)., Tuscan by birth, Roman by pontifical summons, in 1952 he became substitute next to Perosi in the Sistine Chapel and from 1956 he became its Maestro Perpetuo. 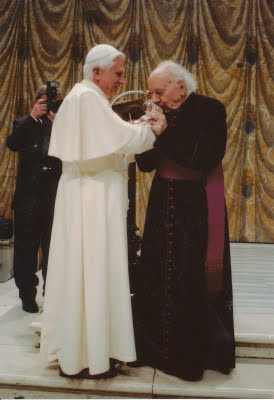 On the 24th of June, 2006 the reigning pontiff organized a special ceremony in honor of the musician (see the picture above), in order to consecrate “ad perpetuam rei memoriam” his closeness to the great master. During the occasion the Pope said: “ sacred polyphony, especially the one belonging to the Roman school, is a legacy which we must preserve with care (..); a genuine updating of the sacred music can only take place within the great tradition of the past of the Gregorian chant and of the sacred polyphony”. S.C.
A meeting with Monsignor Domenico Bartolucci, the distinguished Mugellan musician, Maestro Emeritus of the Sistine Chapel, admirer, friend and collaborator of Benedict XVI. It is a sunny afternoon on the green hills of the Mugellan landscape, when we arrive on the Roman church of Montefloscoli, in the antique rectory full of memories the Maestro Perpetuo of the Sistine Chapel is enjoying the fresh air, behind him a framed photo of the hug the reigning pontiff is giving Monsignor Domenico Bartolucci, the successor of Lorenzo Perosi in the Sacred Palace. On his writing-desk the now-famous book of Monsignor Brunero Gherardini: “Il Concilio Vaticano II- un discorso da fare” (“The Second Vatican Council – a debate to be started”), edited by Edizioni Casa Mariana. It is on the subject of the liturgical reform that we start our conversation with the Maestro, with Domenico Bartolucci, who in liturgical and musical matters has been at ease working and giving counsel to five popes and who is a friend and collaborator of Benedict XVI, whose work he says is “an immense gift to the Church, if only they would let it work”. To tell the truth, I have always and without interruption celebrated it since my ordination … on the contrary, I sometimes found it difficult to celebrate according to the modern rite, even if I never said so. The Mass which never was abolished, is it not? Those are the words of the Holy Father even if some people pretend not to understand and even if many in the past have argued that the opposite is true. Maestro, you have to admit to those who are denigrating the old Mass that it is not a Mass open to participation. So that you won't think that I'm just saying anything, I know how participation in old times was like, both in Rome, in the (St. Peter's) Basilica and outside it, for instance down here in Mugello, in this parish, in this beautiful countryside, which was then populated by people strong in faith and full of piety. 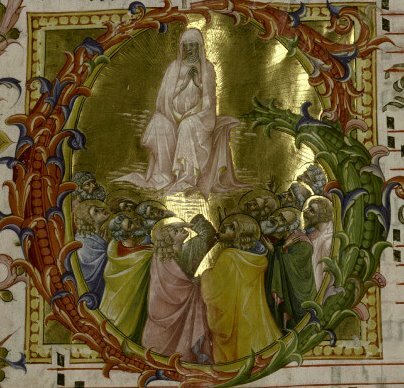 During Sunday Vespers the priest could just start singing “Deus in adiutorium meum intende” and thereafter fall asleep on his seat to wake up only at the “chapter”, the peasants would have continued alone and the heads of the family would have intoned the antiphon! Do we see a veiled polemic, Maestro, in your confrontation with the current liturgical style? I do not know, if you have ever been at a funeral and witnessed those “hallelujahs”, hand-clapping, giggly phrases, etc. One really asks oneself if these people have ever read the Gospel. Our Lord himself cried over Lazarus and his death. Here now, with this oily sentimentalism, nothing is respected, not even the suffering of a mother. I would like to show you how the people in old times participated in a Funeral Mass and how in the midst of that compunction and devotion, the magnificent and tremendous “Dies Irae” was intoned. Was the reform not done by people who were conscious of what they were doing and well educated in the teachings of the Roman Church? We agree with you, Monsignore, but is it not true that the people did not understand…. Dearest friends, have you never read Saint Paul: “It is not important to know anything but what is necessary”, “it is necessary to love knowledge ad sobrietatem”. At this rate, after a few years people will pretend to understand “transubstantiation” in the same way as they explain a mathematical theorem. But just think of it that not even the priest may quite understand this mystery! But how could it have come to this twisting of the liturgy? It became a kind of fashion. Everybody talked about it, everybody “was renewing”, everybody was trying to be like popes (tutti pontificavano) in the wake of sentimentalism, of eagerness to reform. And the voices that raised themselves to defend the two thousand year old Tradition of the Church, were cleverly hushed. There was the invention of a kind of “people’s liturgy” … when I heard these refrains, it came into my mind something which my professor at the Seminary used to say: “the liturgy is something given by the clerics to the people” (“la liturgia è del clero per il popolo”). It descends from God and does not come up from the bottom. I have to admit, however, that this foul-smelling appearances have made themselves a bit more rare. The young generations of priests are maybe better than those who came before them, they do not have the ideological fury of an iconoclastic ideology, they are full of good feelings, however they lack in education. What do you mean, Maestro, when you say “they lack in education”? It means that they need it! I am speaking of the structure that the wisdom of the Church had so delicately chiseled in course of centuries. You do not understand the importance of the seminary: a liturgy that is fully lived, the orderly articulation of the different periods of the year and all this experienced in social communion with the brothers... Advent, Lent, the big feasts that follow after Easter. All of this is educational and if you only knew how much! A foolish rhetoric wants to depict the seminary as something which spoils the priest, that the seminarians, remote and far away from the world, remain closed in themselves and distant from the people. This is pure imagination, invented by people who wish to dissolve an age-old formative richness and replace it with emptiness. Let us return to the crisis of the Church and to the fact that so many seminaries have closed down, do you, Monsignore, support a return to the continuation of Tradition? Look here, to defend the old rite is not the same as being a worshipper of ancient times; it is to be “eternal”. You see, when one gives the traditional mass names like “Mass of Saint Pius V” or “Tridentine” one is wrong, it makes it seem as if it is a mass belonging to a certain epoch. It is our Mass, the Roman universal Mass, valid everywhere and in all times, a single language spoken from the Oceania to the Arctic’s. Concerning the continuity in time, I would like to tell you an episode. Once we were together with a Bishop whose name I forgot, in a small church in Mugello, when there came the sudden notice that a brother of ours had died. We suggested that we at once celebrate a Mass, but then we realized that we only had old Missals at hand. The Bishop refused categorically to celebrate. I will never forget it and I repeat that the continuity of the liturgy means that – except for small details – it can be celebrated today, with that old dusty missal standing on a bookshelf and which for four centuries or more has served my predecessors. Monsignore, there is much talk about a “reform of the reform” which could take away the deformities that came in the 70-ies. What do you mean, Maestro? Let us for instance take the innovations in the seventies. Some ugly songs in beat that were in vogue in the churches in 1968, are today already archeological pieces. Giving up perennity and emerging oneself in time, means that one is condemned to the fads of fashion. In this connection I come to think of the Reform of the Holy Week in the 1950's, made with some hurry under the pontificate of a Pope Pius XII who was already exhausted and tired. Only some years later, under Pope John XXIII who in liturgical matters was of a convinced and moving traditionalism, came a telephone call to me from Mons. Dante, Master of Ceremonies of the Pope, who told me to prepare the “Vexilla Regis” for the coming celebration on Good Friday. I was somehow taken aback and answered: “They have forbidden me to do it”. The answer was: “But the Pope wishes it.” In a few hours I organized the repetitions of the songs and very happily we sang again the same songs which the Church had sung in many centuries on that day. All this only to say that when one distances oneself from the liturgical context those voids become difficult to fill and you can be sure they are noticed! In front of our liturgy of many centuries we should contemplate it and venerate it and remember that in our mania for “improvements”, we only risk doing great damage. Maestro, what role does music play in this process? It has an incredibly important role for many reasons. The affected “Cecilianism” to which certainly Perosi was no stranger, with its tones that were so mild and enticing to the ear had introduced a new romantic sentimentalism, which had nothing to do, for instance, with the eloquent and solid physicality of Palestrina. Some extravagant deteriorations introduced by Solesmes had cultivated a subdued gregorianism, which also was the fruit of a pseudo-restauring passion for the Medieval ages, which were so popular in the nineteenth century. The idea of an opportunity to recuperate the archeological vein, both in music and liturgy, of a past, from which the so called “oxen centuries” (seculi bui) of the Council of Trent separated it ….. in short an archeology which has nothing at all to do with Tradition and which wishes to restore something which maybe never existed, is a bit similar to certain churches restored in the “pseudoromantic” style of Viollet-le-Duc. What does it mean, Monsignore, when in the musical field you attack Solesmes? This means that the Gregorian chant is modal, not tonal and not rhythmical, it has nothing to do with “one, two, three, one, two, three”. We should not despise the way people sung in our cathedrals and replace it with a pseudo-monastic and affected murmuring. A song from the Middle Ages is not interpreted with theories of today, but one should go about it as it was then. Moreover the Gregorian chant of another historical time could also be sung by the people, sung using the force with which our people expressed their faith. Solesmes never understood this, but we should recognize the learned and great philological work executed on the old manuscripts. Maestro, how far have we come in our days with the restoration of Sacred Music and the Liturgy? I cannot deny that there some signs of restoration, but I still can see that there persists a certain blindness, almost a complacency for all that is vulgar, coarse, in bad taste and also doctrinally temerarious. Most important, do not ask me, please, to make a judgement on the guitar-players and on the tarantellas which are sung during the Offertory.….The liturgical problem is serious, do not listen to the voices of those persons who do not love the Church and who oppose the Pope and if you want to cure the sick then remember that the merciful doctor makes the wound purulent (fa la piaga purulenta). Participants approved the scheme for the assembly document presented by Filipino Bishop Luis Antonio Tagle of Imus, chairman of FABC’s Office of Theological Concerns. He will be writing the document summarizing the assembly discussions and pastoral recommendations addressing concerns and challenges related to living the Eucharist in the region. Bishops had reported that in Asia there are “death-dealing” and “life-giving” forces at work that impact the way people live their faith and celebrate the Eucharist. Among the life-giving forces is the renewed faith found in small Christian communities, increased Bible sharing and interest in interreligious dialogue. Bishops in the plenary talked about forms of worship and adoration in their areas, and a “hunger” for the Eucharist in places such as Indonesia, Myanmar, Mongolia and Timor Leste. In Indonesia, Cambodia, Laos, and other places, such hunger cannot be satisfied due to a lack of priests, they noted. There the people have not been given enough catechesis and information about their faith and the Eucharist, while in places such as India and Pakistan they suffer from religious fundamentalists who prevent Christians from practicing their faith due to centuries-old misunderstandings. The bishops also proposed extensive discussion of the Eucharist as a medium of reconciliation, especially amid war and ever-increasing nationalism. Other bishops want the final document to include discussions of growing problems of materialism, family separation due to forced migration caused by wars and unemployment, loneliness that leads to depression and suicide, and equal treatment of all, especially women and children. 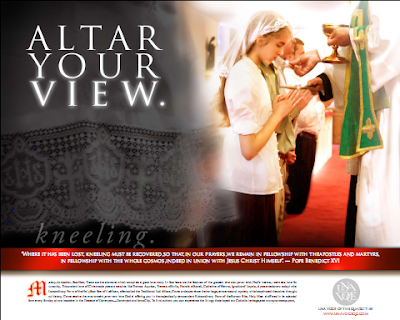 Bishop Tagle said the paper will aim to present these using prayers, rites and symbols used in the Mass. Voting delegates approved Bishop Tagle’s outline in principle and authorized members of the central and standing committees to approve the final paper that he will submit to FABC Secretary General Archbishop Orlando Quevedo of Cotabato within a month. The message recommended “devout listening to the Word every day at home as a family, especially on the eve of Sundays to prepare for the Eucharist.” Pastors and church workers were reminded to help heal those who experience “the trauma of hopelessness” through the Mass. More from Cardinal Arinze on inculturation and liturgical "updating"
Following up on an earlier posting, here are a some significant excerpts from Francis Cardinal Arinze's homily at the Closing Solemn Mass of the Ninth FABC Plenary Assembly in Manila, the Philippines, on 16 Aug. 2009. Cardinal Arinze's homily was titled, "Living the Eucharistic Mystery." Than Truth’s own word there is no true token." This faith demands the surrender of our will, the sacrifice needed in order to believe or not to trust in the senses. Freed from doubt and pride, we are made free for the light of faith. 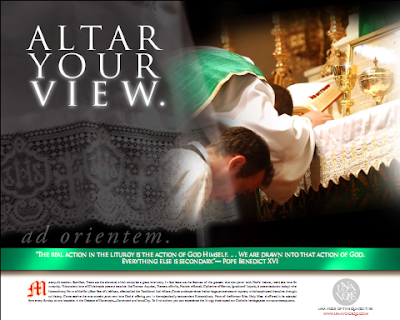 We are ready to adore. . . .
Adoration manifests itself in such gestures in genuflection, deep bow, kneeling, prostration and silence in the presence of the Lord. Asian cultures have a deep sense of the sacred and transcendent. Reverence in Asia to civil authorities sometimes shows itself in clasped hands, kneeling, bows, prostration and walking away while facing a dignitary. It should not be too difficult to bring and elevate this cultural value to honour our Eucharistic Jesus. The fashion in some parts of the world of not installing kneelers in churches should not be copied by the Church in Asia . . . . The way in which Holy Communion is distributed should be clearly indicated and monitored and individual idiosyncracies should not be allowed. In the Latin Rite, only concelebrating priests take Holy Communion. Everyone else is given, be the person cleric or lay. It is not right that the priest discard any of the vestments just because the climate is hot or humid. If necessary, the Bishop can arrange the use of lighter cloth. It is altogether unacceptable that the celebrant will opt for local dress in the place of universally approved Mass vestments or use baskets, or wine glasses to distribute the Holy Eucharist. This is inculturation wrongly understood . . . . It is the tradition of the Church that during the Mass the readings are taken only from the Holy Scriptures. Not even the writings of the Saints or Founders of Religious Orders are admitted. It is clear that the books of other religions are excluded, no matter how inspiring a particular text may be. . . . The major Church documents that give directives on how inculturation is to be made are Sacrosanctum Concilium, 37-40, the 1994 Instruction: Roman Liturgy and Inculturation, and Chapter IX of the General Instruction on the Roman Missal. If these directives are followed, the local Church will be spared questionable or downright mistaken innovations and idiosyncracies of some enthusiastic cleric whose fertile imagination invents something on Saturday night and whose uninformed zeal forces this innovation on the innocent congregation on Sunday morning. Dance in particular needs to be critically examined because most dances draw attention to the performers and offer enjoyment. People come to Mass, not for recreation but, to adore God, to praise and thank him, to ask pardon for their sins, and to request other spiritual and temporal needs. 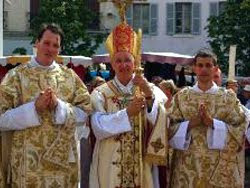 The monasteries may be of help in how graceful body movements can become prayer. . . .
Bishop Dominique Rey of Frejus-Toulon will be ordaining two priests according to the traditional rite of ordination on September 26, 2009 in the cathedral of Toulon. Of note is the fact that both of them will be ordained for the diocese. Deacon Marc de Saint-Sernin will be serving as a diocesan priest for Frejus-Toulon. The other ordinand, Deacon Eloi Gillet, will be serving with the Missionary Society of Divine Mercy, which runs the personal parish for the TLM in the same diocese (St. Francois de Paule). To my knowledge, Frejus-Toulon is the only diocese in the whole world that offers to its seminarians the choice of being ordained either according to the usus recentior or the usus antiquior. (14 priests and 11 deacons had been ordained for the diocese of Frejus-Toulon according to the liturgical books of Paul VI last June.) As mentioned previously in this blog, the diocesan seminary of Toulon is open to those who wish to become priests of the diocese while continuing to prefer the usus antiquior. Source: diocesan website of Frejus-Toulon and private correspondence. Racist comments about Asians will not be tolerated here! cunctas hæreses sola interemisti in universo mundo! The Catholic Anchor interviewed Fr. Thomas Brundage JCL, who will be the regular celebrant of this Mass. The interview can be found here. There is now a twice-weekly traditional Latin Mass in the Diocese of Dodge City, Kansas. Retired Benedictine Father Rene Guesnier, OSB, has moved to his hometown parish, St. Francis Xavier parish of Seward, and offers the TLM (Low Mass) Sundays at 11 am, and Mondays at 8:30 am. He also offers Novus Ordo Masses at the same parish. The church is located at 8th and Lincoln in Seward, Stafford County, south of Great Bend and east of Larned. This diocese had previously been lacking even a single regular TLM. Dublin Archdiocese: Saturday, 15 August, Feast of the Assumption – 10.30 am, Solemn High Mass, St Kevin’s Church, Harrington St, Dublin 8. 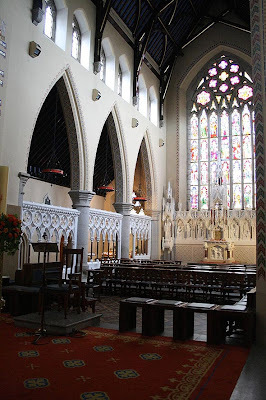 Celebrant: Very Rev Father Gerard Deighan, Adm.
Dublin Archdiocese: Saturday, 15 August, Feast of the Assumption – 11.30 am, Mass, St Joseph’s Chapel, Newtownmountkennedy, Co Wicklow. Celebrant: Very Rev Father Seán Smith, C.C. Derry Diocese: Saturday, 15 August, Feast of the Assumption – 12 pm, Mass, St. Columba’s Church (Long Tower), Derry BT48 6TJ. Celebrant: Very Rev Father Roland Colhoun, Adm.
Raphoe Diocese: Saturday, August 15 - 4 pm Mass. Cathedral of Ss Colmcille & Eunan, Letterkenny, Co Donegal. Celebrant: Father Joseph Briody, CC. Down & Connor Diocese: Saturday, 15 August, 4 pm – Solemn High Mass, St. Patrick’s Church, 199 Donegall Street, Belfast BT1 2FL. Celebrant: Rev Father Martin Graham, C.C. 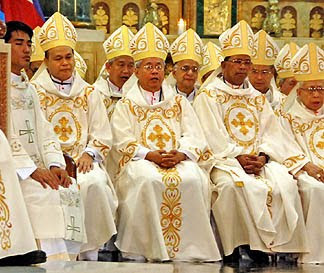 The Federation of Asian Bishops' Conferences is presently holding its 9th Plenary Meeting in Manila (August 11-16, 2009), with seven cardinals (including the representative of the Holy See, Francis Arinze) and around 80 bishops from 22 nations in attendance. The theme of the meeting is "Living the Eucharist in Asia." 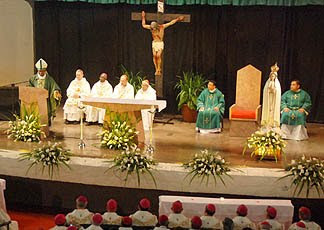 In his homily in Manila cathedral during the opening Mass, Cardinal Arinze conveyed the Holy Father's wishes, stating that the Holy Father "rejoices at your choice of theme, and he prays that this Assembly be celebrated with great solemnity and that it brings abundant fruit for the peoples and cultures of the Asian continent. He requests the Bishops in particular to teach Christ’s faithful the importance of participation at the Eucharistic Celebration especially on Sundays and of receiving the Sacrament of Reconciliation. Priests, being ministers of the Eucharist, are to be greatly esteemed and supported and vocations to the priesthood to be promoted especially in the year for Priests." The final document should be.... interesting, to say the least. MANILA (UCAN) - Asian bishops discussed the prospects and challenges of living the Eucharist in their countries on the second day of meetings at the 9th FABC Plenary Assembly in Manila. Seventeen bishops' conference heads and two associate members of the Federation of Asian Bishops' Conferences (FABC) on Aug. 12 discussed the working paper of the Aug. 11-16 assembly, presently taking place at Pius XII Catholic Center. Titled after the assembly's theme, "Living the Eucharist in Asia," the paper was presented to them the previous afternoon by its author, theologian Bishop Luis Antonio Tagle of Imus, the Philippines. A committee has been tasked to draft a final document, incorporating the inputs of participants. During the discussion session, the Church leaders spoke about the situations in their countries and how the Eucharist was considered the "source and summit" of the life of their Churches. For Archbishop Paulinus Costa of Dhaka, the Eucharist in Bangladesh is a reflection of his people's need for "daily bread" and the Christian belief in sharing wealth with the poor. The average daily wage in Bangladesh is only about US$0.50. Several bishops stressed the value of inculturated Eucharistic celebrations. "Attempts must be made to use Asian culture and symbols related to the Eucharist," said Archbishop Oswald Gracias of Bombay, India. He thinks there are times when too much talking and singing goes on in the liturgy with not enough time for silent reflection. He added that the Church "should promote the sanctity of the body, since we are temples of the Holy Spirit, especially the sanctity of the woman's body" which in many cases has been "sold into prostitution and slavery." Korean Bishop Peter Kang U-il of Cheju suggested providing concrete examples of "living the Eucharist in Asia." If not, the bishop warned, the meeting's final statement could end up as just another Church document read by a few and then forgotten. He believes Sunday Mass can be more meaningful if small "communities of believers" gather ahead of Mass to read and meditate on Scripture. He cited the practice of Jewish families who gather on the eve of the Sabbath to prepare for religious ceremonies the next day. He also suggested the Eucharist could be used for people to reflect on the continuing "arms buildup" in Asia. (??? -- CAP) The Eucharist, he said, is about unity and peace, and noted that nations are increasingly preparing for war. Sri Lankan Bishop Vianney Fernando of Kandy said people in his country are tired after decades of civil war. They need the Eucharist to help bring about reconciliation, trust and forgiveness, he said. While Catholics remain loyal to the Church, he added, there is a need for them to reach out to other faiths. He stressed that there is a need to emphasize the "Word of God" because people are hungry for Christ's message. Bishops from Indonesia, Laos and Myanmar said their people's "hunger" for the Eucharist is difficult to satisfy because of a lack of priests and catechesis. In many places in these countries, where Masses are held irregularly, Catholics celebrate a Liturgy of the Word conducted by catechists or lay ministers. In Laos and Cambodia there are only about 60 priests to cover vast areas, said Church leaders from these countries. Catechetical work is also sporadic in Laos because of the Communist regime, they added. Thai Bishop George Yod Phimphisan of Udon Thani said that participation in Basic Ecclesial Communities has changed Thai Catholics. They now come together to meditate on the Word of God, and then go out and live the Eucharist in their small communities. He said the use of some Thai and Buddhist symbols also makes the Eucharist more understandable to Thai people, who are mostly Buddhist. The FABC is a voluntary association of episcopal conferences in Asia, established in the 1970s to foster among its members solidarity and co-responsibility for the welfare of Church and society in Asia. From Uzbekistan, though, comes a small sign of genuine liturgical renewal. In an interview with UCAN, the Apostolic Administrator of that country, Msgr. Jerzy Maculewicz, said that he has started "...to invite people to pray with the breviary in front of the Blessed Sacrament on weekday evenings. About 10-30 people attend each time." The Colombian Catholic Church has confirmed today that it has maintained contact by telephone with the chief leader of the FARC (the Revolutionary Armed Forces of Colombia, a terrorist Communist organization), "Alfonso Cano", and another guerrilla leader, who are interested in presenting a peace proposal to the government. 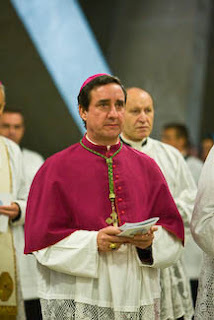 Cardinal Darío Castrillón Hoyos indicated that he has spoken with the rebels in virtue of the authorization, given by the Colombian President Álvaro Uribe to the Bishops, to mediate contacts between the Government and the FARC: "Yes, I have held telephone conversations with 'Alfonso Cano' [pseudonym for Guillermo León Sáenz] and with another whose name I do not recall at this moment," the Cardinal said briefly. The prelate made the announcement after a meeting with President Uribe this Wednesday. Uribe indicated last April that the only groups which were authorized to maintain contacts with the FARC were the Catholic Church and the International Red Cross. Sources: El Tiempo (Colombia) and Noticias24 (Venezuela). Note: May God, through the intercession of Our Lady of Chiquinquirá, bless the efforts of this great Cardinal, who struggled so much for peace within the Catholic Church, to reach a peaceful end to the 45-year conflict which has led to so much bloodshed in that Catholic nation. This Mass inaugurates a new, weekly TLM in the said parish, which is located in the Diocese of San Bernardino, California. Please feel free to post your own announcements in the combox. On the Feast of the Assumption, Saturday, August 15, 2009, Mater Ecclesiae Roman Catholic Church of Berlin, NJ will celebrate the Ninth Annual Mass of Thanksgiving at a new location, viz., the historic St. Peter Roman Catholic Church, 43 W. Maple Ave., Merchantville, New Jersey. This Solemn High Traditional Latin Mass will begin at noon and will feature the Ars Laudis Festival Chorus and Orchestra. The Mass setting chosen for this wonderful day is the Missa Sancti Nicolai by Franz Joseph Haydn. Mr. Nicholas Beck will direct the singing of the Gregorian Propers. Dr. Timothy McDonnell will be the conductor for this Mass. Fr. William Young will be offering Mass on August 15, Feast of the Assumption of Our Lady, at 10 A.M. in the Holy Rosary Chapel (in St. Vincent's School for Boys), 1 Vincent Drive, Marinwood, San Rafael (19 miles north of SF). Fr. 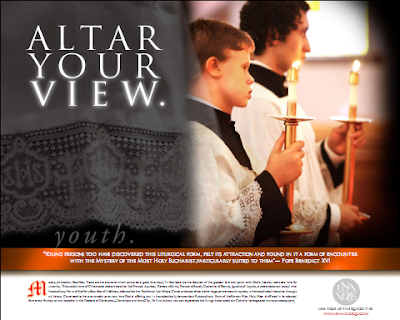 Young -- who was featured in Priest, Where is Thy Mass, Mass, Where is Thy Priest? -- offers Mass in the same chapel every Sunday at 12:15 P.M. The faithful spontaneously wishing to attend Father's private daily Mass in San Francisco (in Most Holy Redeemer) need to contact him directly at 415-863-6260 ext 15. He cannot publicize a private daily Mass until he has a stable group of 30, per the diocesan guidelines. The Franciscan Friars of the Immaculate in the Marian Friary of Our Lady of Guadalupe (199 Colonel Brown Road, Griswold, Connecticut 06351 (860) 376-6840 friars@figuadalupe.com) will be having a Missa Cantata in honor of St. Maximilian Kolbe on August 14, 7:00 P.M.
Said friary has the TLM on certain feast days.